Elderflowers infuse this versatile syrup with a unique aroma and taste. Use it to make beverages or as a delightful topping on fresh fruit, yogurt, and desserts. You can use fresh or dried elderflowers for this recipe, but the flavor is best if you use freshly picked flowers. Harvest the whole flower heads when the creamy white florets have just recently opened. Be sure to leave some flowers on the shrubs so that you (and the birds) can enjoy elderberries in late summer. If you are foraging your elderflowers from wild plants, be 100 percent certain of your identification! You want to use Sambucus canadensis or Sambucus nigra. Rinse the flower umbels and give them a good shake to remove any insects or debris. Remove the small florets from the stems using scissors or your clean fingers, dropping them into a large bowl or non-reactive container (no cast iron, copper, or aluminum). Compost or discard the stems. The only edible parts of Sambucus are the flowers and berries - all other parts are toxic. A few stray stem bits in with the flowers in this recipe won't hurt you, but you want to get rid of most of them. Add the lemon juice and zest to the flowers. In a separate pot, bring the sugar and water to a boil, stirring to dissolve the sugar. Once the sugar has completely dissolved, pour the hot syrup over the elderflowers and lemon. Stir well. Cover the bowl or container. Leave the mixture at room temperature for 3 to 5 days. During this time the flavor of the elderflowers will infuse the syrup. 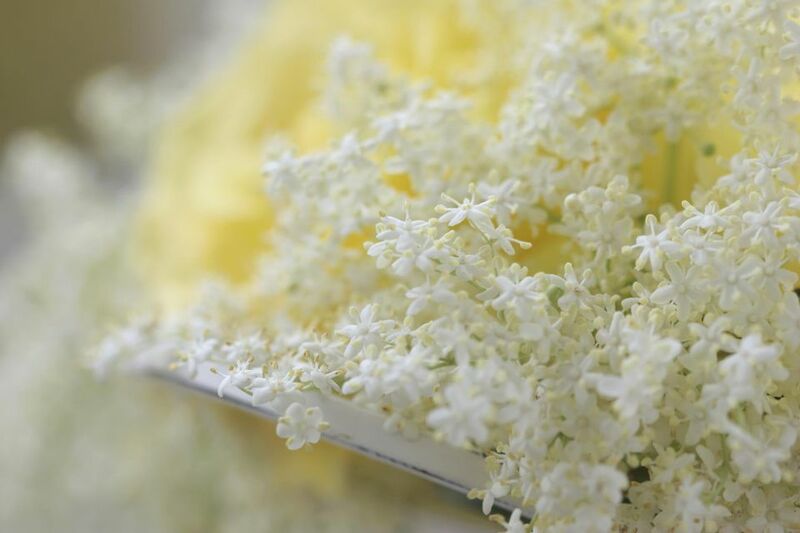 Strain the elderflower syrup through a sieve or colander lined with cheesecloth or butter muslin. Transfer the syrup to clean glass jars or bottles. Elderflower syrup will keep in the refrigerator for 1 month. For longer storage at room temperature, bring the strained syrup to a boil. Pour it into clean canning jars or bottles leaving 1/2-inch of head space. Process in a boiling water bath for 10 minutes. Once sealed, the syrup will keep at room temperature for at least a year (store opened jars in the refrigerator). A tablespoon or two of elderflower syrup in seltzer or club soda makes a refreshing beverage. Add elderflower syrup to white wine or vodka for an aromatic aperitif. Drizzle elderflower syrup over fresh fruit (it's especially good with strawberries), yogurt, or ice cream. Add a small spoonful of elderflower syrup to heavy cream before whipping it for a delicately flavored dessert topping. Prickly Pear Syrup Recipe for Enhanced Cocktails, Pancakes, and More!